On Parenting: We're All Just Making it Up As We Go. Beware of people who tell you they are ready to have children. I was twenty-two when a nurse with icy hands coached me through breastfeeding my minutes-old child for the first time. Those first few days gave me a false sense of security, with nurses helping to bathe and feed this tiny new person, a whirlwind of visitors hugging and gifting and cheering me on, I thought that maybe I was qualified for this whole motherhood thing afterall. Eight years later, I know better. I would have to live to be about a hundred and forty in order to have the necessary wisdom, self awareness and grace to shepherd a fragile little human into adulthood. Children have a way of exposing our own immaturities. Like when I shout at an inanimate object out of frustration and turn around to see the horror and confusion on my children's faces. What ridiculousness that I would be angry at a screen door that won't open or a computer that won't load. Or that I would be jealous when the tired grumpy baby wants her father instead of me at midnight. Or that I would get angry with God when life throws us an unexpected difficulty. I'm a big child who throws spiritual temper tantrums when things don't go my way. This realization sets us free to forgive our own parents. My mother was practically a child when she married my father. She carried all her hurts and fears into this new family just like we all do. Being angry at a parent for the mistakes they made raising us makes about as much sense as scolding a toddler for tripping as they traipse through the livingroom in some adult shoes they've found by the door. Unless they were 140 when they had us, then perhaps they've had enough time to figure things out. So this is parenting -- a broken person or two, still in many ways a child themselves, with all their fears and hurts and hopes and quirks, trying to raise an innately sinful little person to live functionally in this world. I ask myself sometimes what is the one thing I hope my kids will be able to say about their upbringing. I think in my early days of parenting I couldn't have nailed it down to one thing. Parenting wasn't about them back then, it was about me and what I had to prove. I needed to be strict enough to show I cared, but not smothering. I needed to be involved enough, get my hands dirty with glue and glitter and mud pies, but also leave enough room for free play and discovery. I needed to have a clean, tidy perfect space for their developement. I needed them to profess my faith as their own and live it better than I ever could. Now I just hope they will be able to say that home was a place of love and grace. Of course I could be wrong. Thirty-one years on this planet isn't nearly enough to know for sure how not to wreck the beautiful little people entrusted to our care. 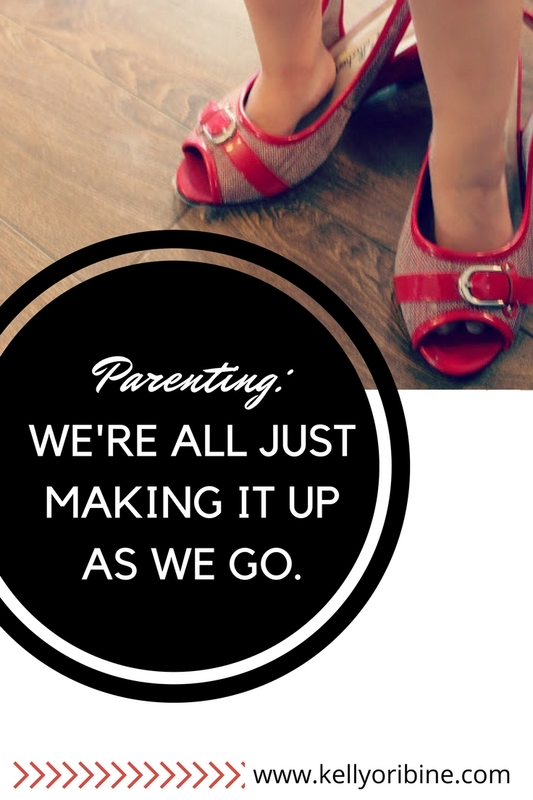 No matter how many parenting books we read and prayers we say, parenting is always a big sloppy experiment full of uncontrollable variables, isn't it? So grace. It always comes back to grace. Maybe as my kids watch me try and try again to extend grace to my own mother, grace to myself, grace to them, they will grow up knowing that we are all a broken mess and that's alright; that I was just a toddler in big girl shoes getting up again each time she fell. I sit down on the livingroom floor as children pile into my lap and I apologize for yelling at the screen door. For frightening them. We cry and hug and go on with our day. My second born confesses to telling a lie, I squeeze her tight and forgive her. We cozy up to read stories on the couch under blankies as if the mess and sin hadn't happened. Every day is an opportunity to live out reconciliation and restoration. Forgiveness and Grace. These difficult moments where we see ourselves for who we really are and are loved despite of it, where we explode or stumble and somehow everything doesn't fall apart, these moments are grace. These moments are truth. If I can give any piece of parenting advice, it is this: work tirelessly to forgive your own parents for their mistakes and pray that one day your kids will forgive yours. Also, beware of people who give parenting advice. We're all just making it up as we go. Oh Kelly, your wisdom always amazes me. I love to read your blogs. Even though at 62, I'm much older than you, I can still learn from you. I often wish I could turn back time and start over with my kids. Hi Kelly! so nice to read you once again. I remember the day I forgave my parents - I was 24. they did the best they could with what the world gave them. i ask God to help me be the best parent i can be, and ask his forgiveness when i know i must. you are once again singing to the choir. beautifully written. So good to see you back! Love that last line. Forgiveness and grace are real "adult" things. I know I used to harbor stuff against my oarents, rail at them in my own mind and heart. Thankfully, I started to see through that a few years back. Even more thankfully, I have this wonderful little boy who helps me continue to see that my parents really did and continue to do the best they know how...just as I do with him. I cannot express to you how much your words connected to my spirit at just the right moment. I am an 19 yr old new mother who frets everyday, worrying about if I am doing an okay job, how my little bundle of joy (and occasional monster baby) is going to turn out, etc. Reading this just gave me a sense of peace. I took a deep breath & just felt so much better afterwards. Older mothers and grandmothers are constantly giving me advice. I can feel the judgmental stares and backhanded comments. But now I know that we are all just trying to figure this out together, no family is the same, and no one has all the answers. Really love this. Thank you.